Satellite photos of the Tesla Gigafactory emerged this week, showing Tesla’s current progress in building their new battery plant. The recent photo shows an enclosed 1670′ (510 m) x 500′ (150 m) footprint with another section currently under construction. This means 1.6 million square feet (148,644 square meters) of space is already available for battery production in the two-storey Reno, Nevada facility. When completely finished, the Tesla Gigafactory is expected to be 10 million square feet (929,000 square meters) of useable space which, by our estimates, means a 3500′ (1066 m) x 1400′ (427 m) final footprint. This will make the Gigafactory one of the largest buildings in the world by footprint and square footage. 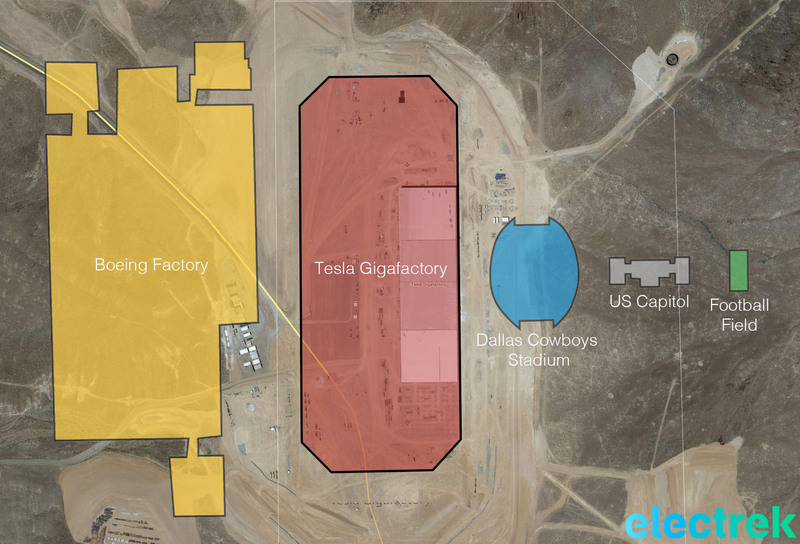 Tesla’s Gigafactory and current size compared to a few notable large structures. The factory is expected to begin cell production next year, although the building will not be complete by then. According to Tesla, by 2020, the Gigafactory will reach full capacity and produce more lithium ion batteries annually than were produced worldwide in 2013.